These AN/PVS-30 Clip-on Weapon Sight were exchanged by the USARMY, with the factory for brand new systems. 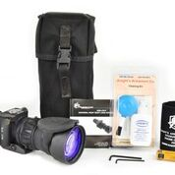 tactical carry case, shroud, lens cleaning kit, AA batteries and certificate of conformance. Uses 2 AA batteries. Designed to be mounted in front of your existing day scope, this night vision device offers 3rd Generation night fighting capabilities to any rifle, including fifty caliber weapons. Available in "ABOVE AVERAGE" condition, these refurbished units come with a 1 year warranty and are less than HALF the price of a new PVS30! These refurbished units are marked "B" for "average" and "A" for ABOVE AVERAGE and once again, we are selling ONLY the ABOVE AVERAGE models.